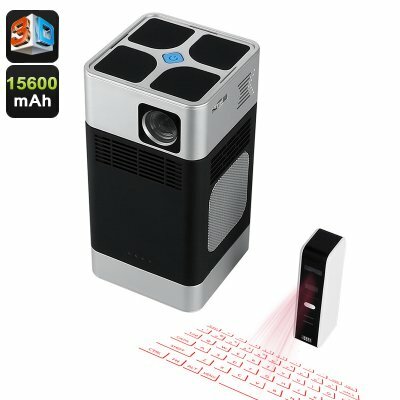 Successfully Added PC01 DLP High Definition Projector - 260 Lumen, 3D Support, Laser Keyboard, Android OS, Dual Band Wi-Fi, 15600mAh Battery to your Shopping Cart. Dual-band Wi-Fi lest you stream content without any wires. With an Android 5.1 OS, 1080P video support and 260 lumens image up to 150 inches across this mini DLP projector gives you great viewing and usability. What's more the 1560mAh battery means you can use it without a power lead. Added to that a durable body and compact lightweight design and you have a great portable movie theater that's easy to carry with you on holidays or business trips. Using DLP projection technology with a Micro Osram LED Lamp brings 260 lumens projections. Thanks to a 1500:1 contrast ration you'll experience better depth between darks and light colors so you have a crisp clean image. The projector can connect via HDMI or USB and with dual-band Wi-Fi that achieves network speeds of up to 65Mbps, you can even stream high definition content, doing away with the need for cables completely. You can enjoy 3D projections that offer you a lifelike movie experience and immersive viewing that brings your movies to life. This will put you in the center of the film and the action. The Android 5.1 interface means this projector can work independently. To make this easier there is a laser projection keyboard that's a doddle to use. Just add a Bluetooth mouse and it's good to go. This makes it super easy to surf the web or open apps like Netflix or YouTube and find the shows you want to play. This mini projector comes with 12 months warranty, brought to you by the leader in electronic devices as well as wholesale projectors..